TypeScript fanboy, Microsoft engineer, ParisTypeScript co-organizer. As you may notice, I’m a huge fan of TypeScript and I’m really proud to be an active developer of the Paris community. I love TypeScript because this langage is awesome and it works great with Node.js. Most of the time, I teach TypeScript to other developers and I always try to do my best to impart my passion for this langage. On another hand, as a Microsft PFE, I don’t have a lot of time to build softwares… That’s why I spend some of my personal time to build open source projects. TypeScript can be used with many SDK to create usefull stuff for the community. Good examples are Visual Studio Code and Azure DevOps extensions. Both are my favorites Microsoft’s tools. I want to learn Rust this summer, unfortunately Azure DevOps doesn’t support this langage, so I decide to build a dedicated extension (available here). It’s also a good opportunity to talk about the Azure DevOps task library and the ToolRunner! Yesterday, during the Paris TypeScript meetup, I did a presentation of Deno a project built by Ryan Dahl (the creator of Node.js). Slides of my speech are available on Speaker Deck! Tonight, I did a presentation on Behavior Driven Development with my mate Julien Pavon during Node.js Paris meetup. Slides are available as always on Speaker Deck! This second part of my TypeScript serie is dedicated to abstractions, interfaces and generics. The article was really complex to write… This kind of concepts can be consider by senior developers as simple, but when you need to explain that in few words, it’s a pain! To be honest I’m really proud of this one and i had greet feedbacks about it. In the may 2018 issue of Programmez! 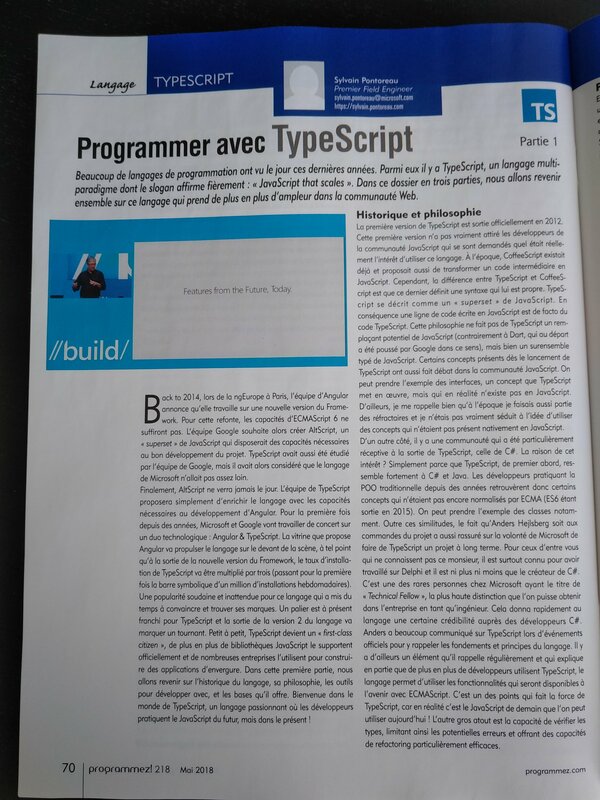 magazine, I wrote an article on TypeScript. Unfortunately, there forgot my picture on top of the article :p. You can buy the magazine on Programmez! website. Blog migration – TypeScript focus! It has been a long time since I wrote technical posts. So much time that my posts were completely outdated… Last weekend I decided to migrate my blog and translate every post in english. To be honest it was easier to remove all the previous technical contents instead of translate them! A page has been turned, I have now a strong engagement as a field engineer on TypeScript, especially with the Paris community and Microsoft customers. It’s time for me to stop using my old friend C# on my private time. I will now only focus myself on TypeScript. In the next few weeks, I will push some articles on Inversify, Cucumber, Node.js, Express and VSTS.